Markets continued to move higher over the period as central banks are expected to remain accommodative, extending the business cycle. Despite that, we believe that it is now too late to chase the rally and therefore our global risk sentiment remains that of mild disinclination. Our equity and bond preferences also remained unchanged at mild disinclination as the current environment is characterized by political and economic risks. A cautious neutral stance describes the positioning of our portfolios as we focus on identifying growth stories, carry, relatively cheap valuations and diversification. Thanks to a new dose of monetary policy accommodation, central banks in developed markets should be able to extend the business cycle – although somewhat artificially, as they refuse to normalise rates in order to properly flush out the system. There is still too much debt, following a decade of financial repression, and not enough nominal growth, despite a decade of ultra-loose monetary policy. Economic growth in developed economies is now expected to bottom out around the end of the first quarter, before nearing potential economic growth further down the line. While this is not ideal, it will not be enough to trigger inflation concerns. So we are back in a kind of goldilocks scenario with no recession, low inflation and no interest rate hikes. The extra liquidity has annihilated volatility, reflated asset valuations and triggered a new run-to-carry. However, as the influence of monetary stimulus will soon fade, and valuations are not overly appealing, it is now too late to blindly chase the rally. As a result, we did not alter our allocation very much this month. We continue to look for carry, growth stories, relatively cheap valuations and diversification. In this context, we favour hard currency emerging market (EM) debt and subordinated debt for their carry and relatively cheap valuations. Meanwhile, we are warming up to EM local currency debt because of the Federal Reserve’s very patient dovish attitude, which should cap both US rates and dollar strength. On the equities side, we are keeping our overweight to the US as a source of growth, to China and the UK for valuations purposes, and are underweight in Europe and Japan, which lacks any near-term growth sparks, as well as in EMs ex-Asia, where valuations are less appealing. As far as diversification is concerned, we are relying on duration, gold and an exposure to the Japanese yen. Where are the risks? On the political side, the trade war is far from being resolved; we will not witness a return to the good old days of a ‘flat’ globalisation world; and the never-ending Brexit saga is heading into overtime. But these are well-known unknowns – perhaps not yet priced in, but clearly flagged. More worryingly, I wonder how much of the goldilocks scenario is priced in, how solid it is, and thus how long it could last. I am not convinced of its resilience, as very soon economic data will either confirm a bottoming out of nominal growth, with rate hike expectations quickly resurfacing, or it will point to an increased risk of recession. The current scenario appears to be more of a ‘silverlocks’ than a goldilocks situation. Complacency over low inflation, the absence of rate hikes and no recession is the key risk for this year. The economic backdrop has not changed much over the past few weeks. Global growth momentum continues to soften as manufacturing activity in Europe remains under pressure. Additionally, the strong US dynamic of 2018 is fading as fiscal stimulus wanes, and the Chinese economy has yet to feel the full impact of economic policy stimulus. While absolute growth levels are still positive across the main economic area, the growth trend remains weak. If anything, this persistent uncertainty about the ability of economic growth to find a floor after a sustained slowdown is pushing central banks to adopt an ever-more neutral and accommodative stance. This is predicated on continuing downside risks to the growth outlook, in a context of low inflation and subdued inflationary pressures. It also implicitly reflects the willingness of central bankers to prevent expectations of tightening credit conditions from hampering a growth pickup. Our feeling the global economy is at a crossroad persists. On the one hand, there is no evidence the negative scenario of a more pronounced slowdown or recession will prevail. On the other hand, we acknowledge our scenario of a mild growth pickup from the soft growth experienced in Q1 has yet to be backed by concrete evidence. 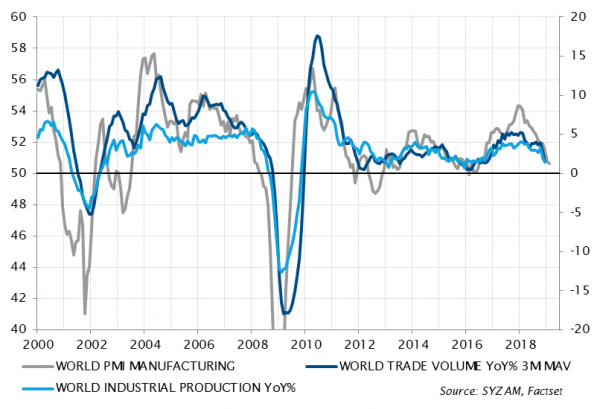 We continue to think the strength of domestic demand in developed economies, fuelled by supportive central banks and fiscal and monetary policy easing in China, will engineer a global growth pickup. But we need to see evidence before we can build on this outcome. We are seeing more of the same from last month. Developed economies are continuing to slow down but remain in expansion for the moment, thanks to domestic demand. Tentative signs of improvement across emerging markets (EMs) are also appearing. 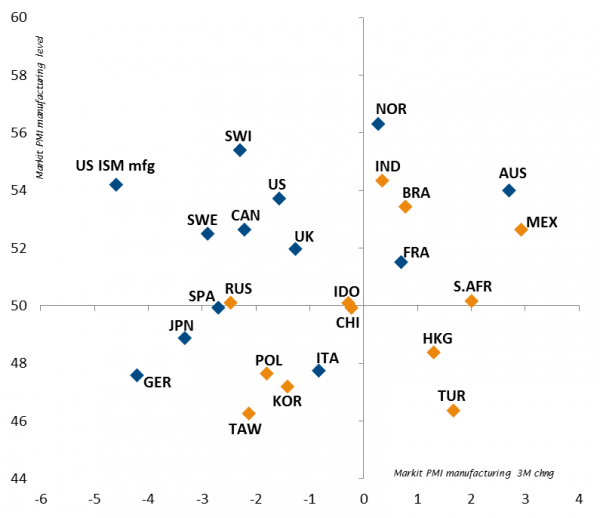 Inflation is low and trendless among developed economies. Trends are more diverse across emerging economies, but generally remain contained, with only a few exceptions. Central banks in large developed economies have now completely paused monetary normalisation. They are in ‘wait and see’ mode, waiting for positive signs of growth pickup before they can resume the normalisation which they contemplated last year. The end of the US dollar appreciation is also relieving pressure on EM central banks. The overall economic dynamic in the US is continuing to get softer. However, most indicators are still at levels consistent with decent GDP growth. And the domestic service-related part of the economy appears to be holding up well, as reflected by the rise in service activity indices, back to fairly strong levels in February. In this context, the Federal Reserve has dampened policy normalisation expectations and is now in a dovish ‘wait and see’ mode. In the euro area, business cycle dynamics remain weak in general. Industrial activity in Germany is still plunging, as measured by the manufacturing PMI, the Ifo Business Climate Index, and industrial production. However, domestic demand is maintaining the economy in very mild expansion – retail sales picked up in January and PMI services rebounded in February. This may ultimately help the economy avoid a recession. The French economy is also supported by domestic demand and household consumption, and is recovering from the soft patch caused by the Yellow Vests movement. Meanwhile, Italy has already drifted towards the edge of a recession, under the pressure of external headwinds and politically-driven domestic uncertainties. The Spanish economy, although losing steam, remains the most dynamic of the eurozone ‘Big Four’. In this context of growth uncertainty, reinforced by the approaching Brexit deadline, the ECB has also dampened expectations for monetary policy normalisation over the next 12 months, by postponing rate hikes to 2020 at the earliest and announcing fresh targeted longer-term refinancing operations (TLTROs) to avoid unwarranted, passive tightening which would have resulted from the maturing of previous TLTROs. Japan’s growth momentum is also fading, as uncertainties around global trade and soft China growth weigh on business sentiment and activity. Here too, the central bank has clearly signalled its readiness to maintain or even increase its accommodative stance. Our feeling that the global economy is at a crossroad remains. The Chinese economy has yet to feel the pickup in domestic demand after the pronounced slowdown experienced last year. A few encouraging green shoots have appeared, especially in the form of a resumption in domestic lending flows, that suggest monetary and fiscal easing measures are finally filtering through to real economic activity. This will be required to offset US trade tariffs, the impact of which is due to materialise this year. South East Asia in general continues to face strong headwinds from these global trade uncertainties. Latin America somewhat stands out. Positive growth momentum has been driven by the favourable impact on sentiment of newly elected presidents in Brazil, where business confidence has improved, and Mexico, where household sentiment has benefited. During the month under review, we kept both risk and duration at a mild disinclination in our asset allocation. Our view remains that while markets and asset prices are once again supported by accommodative monetary policies – with the central bank put back in place – the current ‘goldilocks light’ environment cannot last forever. Either global growth will rebound, in which case markets will quickly become concerned with inflation and the removal of accommodative monetary policies, or growth will falter and we will be stuck in a Japanese-style scenario. No major changes to the asset allocation this month: we kept a fairly balanced approach towards risky assets and interest rate sensitive ones. Switzerland was downgraded for valuation reasons, as it now sits in the mildly expensive camp. We continue to prefer US equities relative to the eurozone, for their defensive characteristics. If global equity markets correct, we prefer to have risk in the US than in the eurozone – despite more expensive valuations – because we believe US markets would fare better. UK equities still look attractive on valuation metrics, but they carry a bit more risk as we approach the new Brexit deadline. We may negatively review our investment case for UK equities depending on which outcome the country seems to be heading for, and especially if general elections are on the way. In the emerging markets space, we prefer Asia – even if valuations have recently gotten more expensive – and Russia, over Latin America and South Africa, for valuations reasons. We have not made any changes to our relative preference for real over nominal government bonds and emerging market hard over local currency bonds. Meanwhile, our disinclination towards investment grade and high yield credit remains valid. In a growth stabilisation scenario, core government rates have even more limited upside, as rates have once again fallen to historically low levels. However, it is worth having some duration in our portfolios to balance the overall risk. In addition, the macro dynamic is still losing strength and the pause in monetary policy normalisation does not support a significant increase in rates. In terms of currency allocation, we kept the British pound at a mild preference, taking into account appealing valuations. For now, these compensate for potential volatility linked to the Brexit saga. We also hold the Japanese yen at a mild preference. Our assessment of the currency continues to be favourable compared to the Swiss franc, which, on the margin, lost its safe haven status on the back of the Swiss National Bank’s monetary policy easing bias. Finally, we ranked gold at a mild preference, for its diversification characteristic in a risk-off environment.